Science would probably progress a whole lot slower without the infinite human imagination. We talk frequently about times that science fiction has predicted coming science advances. But this time, the National Science Foundation has let its scientists do the imagining. This week, the NSF presented its Future of Scientific Imagination, that is, futures extrapolated from present-day NSF-funded research that may one day become a reality. First on their list was a reimagining of the traditional Thanksgiving Dinner. These days, many of us must travel home from faraway cities to share a meal with our parents. Sure, you can Skype a sibling and your nephew, and then place the laptop at the kitchen table, but they can’t taste mom’s lasagna. And given that its the future, what if they were in space? Plus, these days, everyone is worried about the security of those video calls. 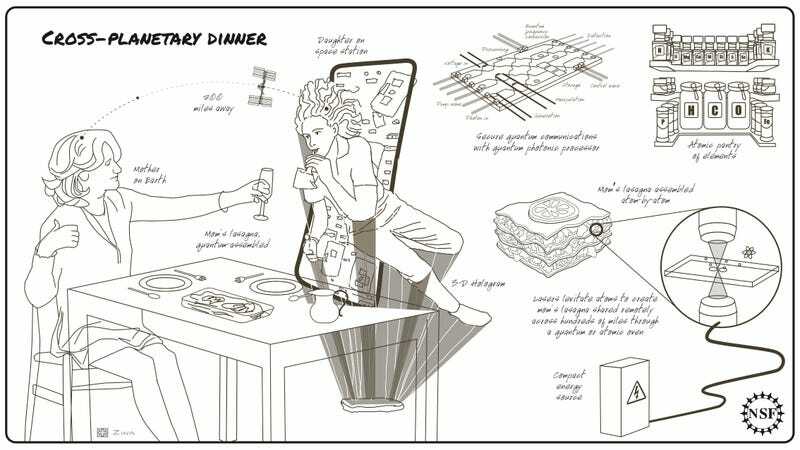 So a team of NSF chemists, physicists, engineers, and social scientists considered what a meal might look like in the future. Perhaps your parents could project you into your family living room via a three-dimensional hologram. Such a video link could be secured through a quantum communications system, like the video call recently shared between the Chinese Academy of Sciences President, Chunli Bai, and President Anton Zeilinger of the Austria Academy of Sciences in Vienna. As for the meal itself, one day some sort of quantum photocopier might be able to construct the lasagna atom-by-atom. This is a future extrapolation of work done by researchers Markus Greiner at Harvard and Eric Hudson at UCLA whose precision methods use lasers to create new types of molecules. Maybe your pantry would store individual elements instead of cans. All of this sounds wild, but the quirks of quantum mechanics introduced now-ubiquitous things like lasers and transistors via a quantum revolution that happened decades ago. “There’s huge commercial interest in quantum computing,” Alex Cronin, NSF physics program director explained to Gizmodo. “The dust hasn’t settled yet on what will be the benefits of the second quantum revolution.” Obviously, programming a quantum dinner assembler is many decades away. The series invited scientists to envision other, less Thanksgiving-related and more Black Mirr0r-esque futures as well, like sensors integrated into clothing, microscopic “robo-ants” that can investigate forest fires, specialy engineered cells that perform specific functions, and living buildings with synthetic leaves. I hate the future, and even some positive dreams about it can sound incredibly dystopian and surveillance state-y. However, not having to fly on a plane to visit relatives over the holidays sounds nice, and I like the idea of my mom’s stuffed cabbage materializing in front of me.